I help run a monthly Computer Club meeting in our community. The club actually meets twice per month, once for a general meeting and once to offer troubleshooting services to members of the community. I keep forgetting to put meeting notices in our community newsletter. That sounds like a job for a calendar program, doesn't it? Yeah, that's what I thought too, so I fired up Google Calendar and added the two dates for the first Monday and the first Wednesday of every month. So far, so good and now all I had to do was to tell it to remind me at an appropriate time. Unfortunately, I ran into an immediate problem. I need to get notices to the newsletter editor very early. If I want something to be in the December newsletter, I need to send it in before the first of November. 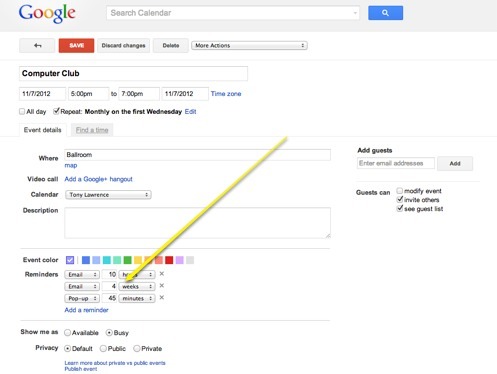 Google Calendar won't let you set a reminder more than one month earlier than an event. If I try to set it for 5 weeks or 32 days, it won't allow that. That's dumb, but there it is: Google doesn't think you'd ever need more than 4 weeks advance notice for anything. So, I turned to Perl. There are many ways to approach this in Perl. You could take a brute force approach, setting the date to December 1st, testing to see if that is a Monday and incrementing to December 2d and beyond if it is not. That's actually not such a terrible way to do it as the date we want has to be before the 8th, so there cannot be many iterations. If you ran that on the 28th of each month, you'd have the first Monday of the 2d month following. Add some code to send email and you are done. I decided to use Date::Calc instead. It's probably no faster (it might even be slower) and it very likely uses a brute force approach itself, but it has a lot of useful functions (68, in fact) beyond just what we need to do here. I'll run it on the 28th of each month and it will send me a reminder email that is ready for any last many editing before being forwarded along to the newsletter. That should help me get my notices to the newsletter on time.